SEATTLE, Wash.—(February 6, 2012)— On December 22, 2011, the Karen Mullen Breast Cancer Foundation presented UW Medicine with $50,000 to support their breast cancer research efforts. The Karen Mullen Breast Cancer Foundation identifies the most promising breast cancer studies taking place in the most successful research labs and helps fund them. 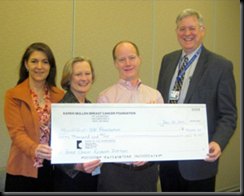 The Seattle-based foundation was established in honor of Karen Mullen, who was diagnosed with triple-negative breast cancer in October 2006. Even though her disease was detected early, triple-negative disease is stubborn and persistent, and, ultimately, she did not survive. UW Medicine healthcare organization was selected as the recipient of $50,000 raised during “Slice of Hope,” which took place last year. UW Medicine, which comprises Harborview Medical Center, Northwest Hospital & Medical Center, Valley Medical Center, UW Medical Center, UW Neighborhood Clinics, UW Physicians, the UW School of Medicine and Airlift Northwest, is among the nation’s leading breast cancer care and research facilities. “Slice of Hope,” spearheaded by Pizza Today magazine editor Jeremy White, brought together national and local pizzerias, including Seattle’s own Tutta Bella Neapolitan Pizzeria, to raise money for the Karen Mullen Breast Cancer Foundation. Participating pizzerias donated 15 percent of pizza sales on October 7 and raised a total of $50,000. More than $20,000 of the total was given by Tutta Bella. In the continued effort to help end this disease, “Slice of Hope” will take place again in October 2012. For more information about “Slice of Hope,” visit: www.pizzatoday.com/sliceOhope. Founded in 2011, Karen Mullen Breast Cancer Foundation is a non-profit organization based in Seattle that funds promising breast cancer research studies being conducted at the most successful research labs across the United States. The foundation was established in honor of Karen Mullen, who lost her life to breast cancer, and in tribute to all women who have or will someday have breast cancer. For more information, visit www.endthisdisease.org.